Hwang Byung-ki plays the "gayageum" (12-string zither) in his Bukahyeon-dong, Seoul home on Sept. 22. This is the fourth in a series of interviews with international pioneers among Korean artists that marks The Korea Times’ 61st anniversary, which fell on Nov. 1, and is sponsored by the Korea Press Foundation. ― ED. He asked for a cigarette break before proceeding with the interview. 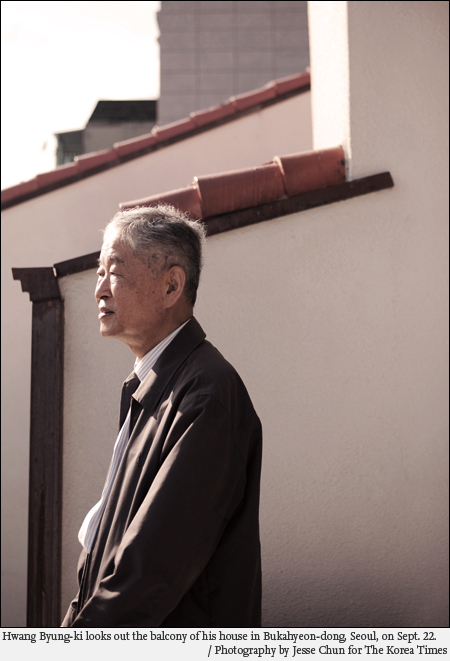 As Hwang Byung-ki mulled meditatively on a second stub by the open window, silence, along with the unusually oppressive autumn sunlight, filled the salon of his Bukahyeon-dong home. Dark shadows seeped underneath the “gayageum”; dozens of the 12-string zither were standing around the room like wooden furniture. There was nothing stilted about the empty minutes, however, for the 75-year-old is a most seasoned composer of time. Music, particularly “gugak” (Korean traditional music), is another means of measuring the hours: emotions are not expressed in harmonies but are shaped with varying rhythmic complexities and calculated patterns of time ― the muted pauses between notes, the hollowness piercing through a tone and the inconsistencies in even the smoothest timbre. A consummate performer and scholar of gugak as well as an internationally pioneering composer, Hwang fashions rhythms in uncanny ways though without compromising the centuries-old spirit of the gayageum. Even when he juxtaposes it with Western instruments or forms, he takes the listener to ancient times and beyond to a more spiritual realm. Yet he creates somewhat quiet art with disquieting effects, and there is something paradoxical about his music. At once an elderly statesman and enfant terrible of the contemporary music world, he steadfastly continues traditions yet isn’t afraid to break away from them, even violently so at times, for the most avant-garde endeavors. His unconventional approach to the art is reflected in the mere fact that he pursued gugak. 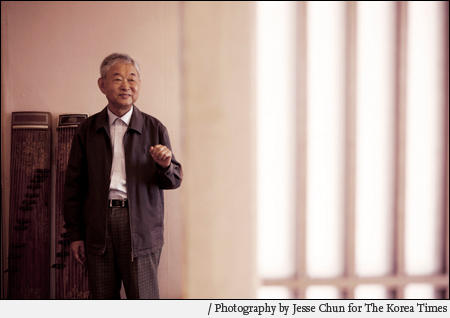 Born in Seoul in 1936, he recalls his revelational first encounter with the gayageum as a prepubescent teen, when Korea had just emerged from Japanese colonial rule and was ravaged by war. The 1950s was a time “when the gayageum was thought to have been long lost since the 5th century,” he said. Still, he fell in love with the instrument instantly ― “I don’t know why. How can you describe your love of a rose? You can’t; you simply love it,” he said ― and continued playing while studying law in college. “My family opposed it and I never intended to become a professional performer either. I didn’t think it was possible,” he said. Back then Koreans were preoccupied with modernization, which meant largely Westernization, and local traditions including gugak were looked down upon. There was only one gayageum shop in the entire country and some 10 zithers were sold per year, he said. Today, the same vendor in Jeonju sells 10,000. True to his word, he emphasized that his opinions are solely his and are neither right nor wrong. This is perhaps the reason why he remains so open to interacting with younger minds; his friendship with the cello prodigy Chang Han-na is quite well-known. He has taught other youths at prestigious universities not only in Korea but also in the United States, including the University of Washington in Seattle and Harvard. The zither player also toured extensively around the world, appearing at the New York Carnegie Hall, Paris Musee Guimet and even in Pyongyang. In fact he can be considered the country’s first true “hallyu” (Korean wave) musician ― decades before today’s K-pop stars. He reacted to this comment with a soft chuckle. “I suppose it’s true,” he said, flashing a rare grin. As the artist recounted his story, along with the occasional anecdotes about his loving children and grandchildren, his stern demeanor softened. He began composing in the early 1960s because “tradition is about passing on the mantle, but in order to continue it’s also important to create contemporary works in tune with the times.” His debut album was released in the U.S. in 1965, when it was rare for any given performer to have his/her own solo disc LP. Hwang proudly offered to show an impeccably preserved copy of the recording, the cover of which featured him as a 28-year-old. Though he was already an established musician, it wasn’t until years later that he truly felt like a professional. Ewha Womans University launched a gugak department in 1974 and offered Hwang, who was 38 at the time, a professorship. “That’s when I decided I would play the gayageum until I die,” he said, without any hint of irony. Hwang has gone on to become a hero of his own; as the first musician to compose contemporary music for the gayageum, he has his own strain of the traditional instrument solo “sanjo.” But he also took part in zany collaborations with such icons as the late Nam June Paik and John Cage, making him a cult favorite of international contemporary classical music fans and modern dancers looking for a unique soundtrack. The lyrical fantasy of his oeuvre is counterbalanced by a most shocking anti-romanticism, not just from song to song but also within a single piece. Even a single volume of sound possesses all the complex simplicity of the universe. In “The Labyrinth,” for example, melodic cooing and sighing feed into moments of shamanistic hysteria, giving the gayageum a jazz-meets-folk treatment. His music, whether meditative or disturbing, is not designed to linger in the background. The musician’s fine art approach brings the writer Jose Luis Borges to mind ― how “time itself is another river” and pure music flows endlessly, seamlessly. “Sodas are undoubtedly the representative drink today, yet modern man continues to consume water the most. I believe people crave not bottled ‘manufactured’ water, but natural spring water. I strive to make music like pure water from the river, the deep mountains,” said Hwang. When asked if he had any messages for the next generation, he shook his head, in spite of a highly decorated academic career. Though the musician has finally left academia (after serving four honorary professorships for a decade since retiring from Ewha) he expects to be busy until the end of the year, when his second tenure ends as director of the National Orchestra of Korea. Hwang shrugged about plans thereafter. But one thing was certain, that he would be experimenting with time. 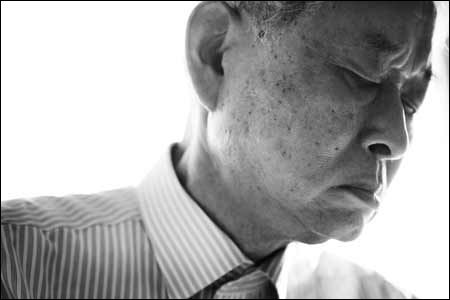 Hwang Byung-ki’s mouth drew an upside down half moon and his face remained stern, barely moving as the camera shutter clicked. Then suddenly, his face lit up as he began to reminisce on his teaching years; his almond shaped eyes creased into a soft line and his lips loosened into a shapeless swirl. Out on the sunlit balcony, he almost looked 10 years younger than during the first 10 minutes of the photo shoot. Once Hwang opened up, he was full of wit and confidence. While speaking about his “gayageum,” he offered to move the 12-string zithers around the room so that they could receive a better angle when photographed. Watching him handle the instruments was like seeing a father trying to score his son a better seat at the game ― there was such faithful “jeong,” a heartfelt connection and concern for the zither. When Hwang played the gayageum with his eyes closed, it was as though he could still see because it was a road that he’s been down many times ― a road that he will continue to take. Jesse Chun is a fine art photographer whose works have been exhibited and published internationally. Chun earned a bachelor of fine arts degree in photography from Parsons School of Design in New York. Visit www.jessechun.com (fine art) or www.jessechunphotography.com (editorial). She can be reached at jessekchun@gmail.com.